A clean, simple does-what-it needs-to freestyle helmet developed and styled by some of the world’s best riders. When you’re pulling massive inverted air out the top of the pipe or just taking your first tentative jumps in the beginner terrain park, protect your grey matter, fool. Wear a lid, this lid. When Giro was developing the Shiv it called in the people who really know what a freestyle rider wants from a helmet: a handful of the world’s best pros. The team who helped are Antti Autti, Gretchen Bleiler, Andy Finch, Steve Fisher and Wyatt Caldwell. The Shiv is a clean lined dome with oldskool skate styling; there are no elaborate channeled, adjustable venting systems, just eight simple slits that can be plugged from the inside with removable foam inserts. 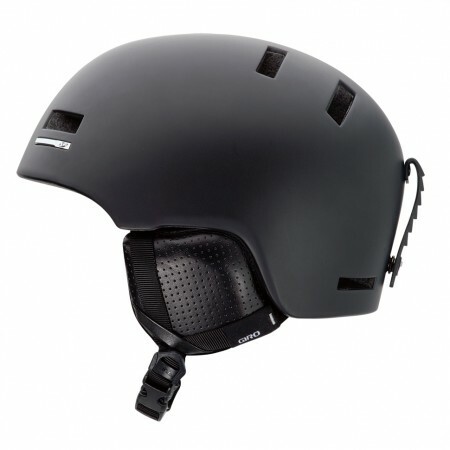 The lack of elaborate venting means that the clima-control will not be as efficient as some other helmets; expect a hot head in all but the coldest conditions. There are no sllding vent shutters either and taking the Shiv off in order to fit or remove the foam vent plugs could be a pain. That said, park and pipe riders arguably don’t need the “on the fly’ adjustment that all mountain riders demand as they spend more time waiting their turn to drop in so have more opportunity to adjust their lid if they really need to. The outer shell is made from a tough polycarbonate and the inner liner from EPS. EPS is a very efficient energy absorbing material that works well under a range of circumstances. The two layers are fused together during construction, a process that is supposed to make the finished helmet more durable yet lightweight. Even though it doesn’t have all the vents of some helmets the Shiv is still surprisingly lighter than it looks. That is partly because it is pared down to the basics. It lacks the full range of adjustability of other Giro models like the Omen, which has an ergonomic clamp that cradles the back of the head. Instead there are just simple foam inserts, two thick, two thin, to help tailor the fit. I may not have many thrills but that isn’t what the Shiv is about. It is a durable lightweight lid that does its job of protecting your head well and looks good doing it. Lightweight, tough and stylish – a great combination of no-fuss function and form.